Oral health requirements change throughout every stage of life, and at PQB Dental Clinic our team are here to support the needs of each member of your family. With an exciting dedicated children’s play area and a compassionate approach to dental care, our practice is the ideal choice if you are looking to establish healthy oral habits for your children. When is the right time to bring my child in for their first check-up? It is never too early to start dental visits, however generally we recommend bringing your child in after their first birthday. This allows Dr. Rogers and his team to better track their dental development and make sure their teeth emerge properly, minimizing the possibility of braces later in life. This is a great opportunity for Mom and Dad to ask any questions about how to help keep their little ones’ teeth clean and healthy. Your child’s primary teeth are vital not only for their dental development but also for their overall development. This is because teeth are a necessity for speaking, forming words and eating. If your child’s teeth are not in good condition, it could impact their development and impair their learning process at a crucial time in their life. 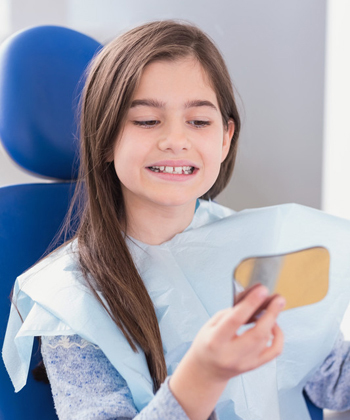 Our team is dedicated to the health and development of your child’s smile, and will only recommend treatment if it is within your child’s best interests. My infant has not yet started teething, do I still need to clean their mouth? The simple answer to this is YES! Even when our children do not have teeth, they are still susceptible to gum disease. Clean your infant’s smile with a clean damp cloth after every feed to help remove any bacteria in the mouth that could damage their gums. It is also important not to put your child to bed with juice or milk, as these liquids are high in sugars and can impact your child’s oral health.